Not since the 17th century have the homes of the rich been so amply fortified. Fueled by homeowners' increasing demands for privacy and security, a new generation of elaborate security gates are being installed around the country. A far cry from the lavishly decorated, overtly showy spectacles of the past, these barriers are designed to be unobtrusive and easily overlooked. Packed within and around them, however, is a plethora of state-of-the-art technology—facial-recognition devices, Internet-connected digital cameras, remote iPad control and other features—that can drive up the cost of an entry up to $1 million or more. 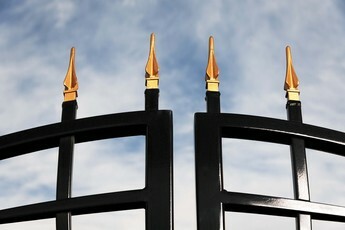 A new generation of elaborate security gates are being installed around the country. A far cry from the lavishly decorated, overtly showy spectacles of the past, these barriers are designed to be unobtrusive and easily overlooked. Tom Cruise's Beverly Hills, Calif., home is fronted by simple rust-colored arched gates. They're no more than 6 feet tall, flanked by sand-colored stone pilasters. But they conceal a small guard shack that sits right inside the property. A dense thicket of 50-foot-tall trees shrouds the long driveway; the home sits about a quarter mile back. Hidden pan-and-tilt cameras are mounted on the stone pilasters and on posts inside the driveway. One sits at dog level, programmed to capture the license plates of cars as they drive in. Steven Spielberg's estate in Pacific Palisades, Calif., has a similarly nondescript exterior. Sandwiched between low white pillars, brown gates, coupled with a wood plank fence wrapped in chain link, block off the property. "Clients used to want huge gates and security detail sitting visibly outside," says Dennis Bridwell, a private investigator and, according to public documents, a longtime security consultant to celebrities like Gwyneth Paltrow and Jennifer Garner. "But those days are over." Even those owners who are continuing to construct traditional extravagant entryway gates are toning them down, erecting their fancy gates well inside their property lines and installing more muted versions for the exterior. Reclusive billionaire Ty Warner, who made his fortune manufacturing and distributing Beanie Babies and is now in the luxury-hotel business, installed a few years ago three pairs of 11½-foot-tall bronze gates for the interior doors to his estate in Montecito, Calif. In a hand-rubbed bronze, they also have glass behind the metalwork. By contrast, he asked Les Métalliers Champenois, a company that specializes in high-end metalwork, to finish his exterior driveway gate with a dark patina to reduce the metal's golden sheen. High-end gate-design firm Picasso Gate, based in Cheyenne, Wyo., books appointments up to two years in advance. Its founder, Brent Nichols, has customized entryways for Mr. Cruise and Kevin Costner; last summer he helped identify and fix a problem with the White House's gate, which had stymied everyone including its manufacturer. "I'm not sure I can really disclose what was wrong with them," he says. "I'm not sure I should be talking to you at all." DoorKing, an Inglewood, Calif., company that manufactures gate-operator systems, has seen orders climb back toward to the levels they had reached before the recession, says Richard Sedivy, its director of marketing. ADT estimates that the North American residential and small-business security market has grown steadily despite the recession and the mortgage crisis, expanding to about $12.5 billion in 2011 from $11.3 billion in 2006 . "We had the worst housing market of all time, but the security business grew right through it," says Jeff Sprague, a managing partner who follows the industry at Vertical Research Partners. There's no single factor behind the drive to fortify. Crime rates have largely fallen around the country; the murder rate is half what it was in 1991, and robberies fell 10% in 2010 from the year before. Still, some gate-makers note that the proliferation of personal information on the Internet has increased some owners' feelings of vulnerability and desire for privacy. Others cite the recent focus on income disparity between America's rich and poor. This gate in Aspen, Colo., was built by Brent Nichols, who helped fix the White House's gates last summer. "The automated driveway gate is the ultimate sign of affluence," says Stratford Gate Systems' President Robert Rayson, who has crafted gates for Nike executives, National Basketball Association players and a Saudi prince. "But nowadays, those gates are also the ultimate taboo—the trademark sign of a one-percenter." Security technology continues to grow cheaper and less intrusive, which makes it easier to design a modest-looking gate that's still heavily fortified, says Gil Neuman, chief executive of Kent Security, a company that caters to high-end gated homeowners and gated communities. Cameras have shrunk in size and price, offering better resolution and clearer images at night. In the last few years, high-end cameras with video analytic software have come into use at the home; the camera and software can determine whether movement outside a gate is generated by a person, animal, truck or plane, based on temperature, even in harsh climates. The last three to five years saw the emergence in more homes of cables running underground that can sense vibrations, allowing a homeowner to detect that someone is digging under or climbing over a fence on a large estate. Alarms can simulate the sound of a barking German shepherd. When the person comes closer to the gate, the "barking" grows louder. The biggest innovation over the past two to three years is the advent of technology that allows homeowners to remotely view the perimeter of their properties using a camera that is connected to their iPad or mobile device. Prices for such systems depend on how many cameras are being used on the property, but can reach $65,000 or more when more than 30 cameras are deployed. This sliding wood gate guards the Los Angeles home of actor-comedian Adam Sandler. Computers can be programmed to control who gets into a property and when. Each individual accessing the home—whether it's the owner or a maid, personal trainer, or gardener—receives an individual code to type into the call box. That allows owners to limit access; owners could restrict the gardener's access to daytime hours, for example. If a gardener punches in a code at night, access is denied and a record of the event is logged. Facial recognition, introduced about a year ago, can cost around $10,000 for each door or gate it's installed on. The highest-end security gates also come with bollards, or short vertical posts, that rise in and out of the ground when a car pulls up to or exits a property. Scott Duryea, vice president of a high-end construction firm near Aspen, Colo., says that his wealthiest clients pay a lot of attention to "visual security," meaning they want to prevent people from peeking into their property. But on the 200-acre estate he recently worked on in the Aspen area, it was impossible to gate the entire property off. So the owners erected trees around it instead, with a gate just at the bottom of the driveway. Creating visual barriers still has a limit, he says: "If someone really wanted to break into this place, they could use a helicopter." 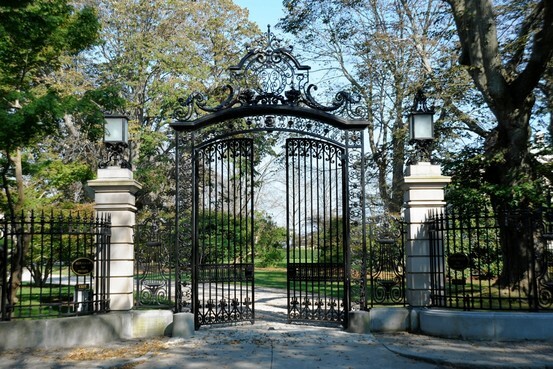 Ex-Goldman Sachs partner David Ford restored his Newport, R.I., estate's historically significant gates. To research how to design a supersafe entryway, Stratford Gates' Mr. Rayson studied White House gates and noticed they used Byan gate operators, a brand of hydraulic operator that opens and closes the gate. He now installs them, as well as electromagnetic locks, on many of his clients' gates, creating a fortresslike effect. The lock has about 1,200 pounds of holding force—enough to stop a group of people or even a slow-moving car. While security experts now often recommend simple-looking gates, believing they're more easily overlooked by potential criminals, the aesthetics of such gates can be deceiving. A simple wooden gate may have steel beams inside it, and a "crash-rated" gate can stop a 15,000-pound truck going 30 miles an hour. Security experts recommend clients place the guard shack behind the gates rather than in front, and hide cameras in trees, inside a birdhouse or within the call box, so homeowners can view their visitors. Round-the-clock patrol by a single guard can cost anywhere from $130,000 up to $500,000 or more, say security experts, depending on how experienced the guard is. Having a guard to man a control room can cost a similar amount, if a homeowner wants a person monitoring the camera feeds at all times. Homeowners can also route cameras to a monitoring center, which will watch feeds for as little as $100 a month. Former California Gov. Arnold Schwarzenegger has a guard outside his home, which is protected by two pairs of gates. He has driveway gates—still covered in Christmas lights in April—at the base of his hillside property. But to get to the base of his driveway, one must first pass through an additional pair of 16-foot-tall gates that enclose the star-studded gated community called Brentwood Country Estates, where Heidi Klum, Gisele Bündchen and Tom Brady also live. Ty Warner had LMC tone down the gates to his Montecito, Calif., estate by using a dark patina. There are exceptions to the new toned-down look. Netscape founder Jim Clark says he built an ornate bronze gate outside of his $110 million Palm Beach mansion simply because he needed an entrance to match the house—not because he wanted a status symbol or privacy. "This place is so grand and so over-the-top," he says. "I couldn't exactly put a chain-link fence up." Last year, Les Métalliers Champenois finished restoring two pairs of gates on Miramar, the neoclassical mansion in Newport, R.I. David Ford, a retired partner of Goldman Sachs, bought the 8-acre oceanfront property in 2006 for $17.2 million and embarked on a historically accurate restoration of the 30,000-square-foot home. He began with the exterior, asking LMC to restore the home's two steel entrance gates, which are about 20 feet tall. LMC restored one and recreated the other, which was too badly damaged to save. The project took about two years and cost Mr. Ford roughly $2 million. 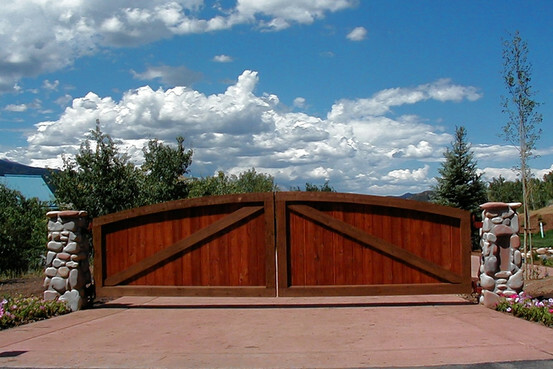 Historical Arts & Casting, another company specializing in high-end gates, is run by three brothers in West Jordan, Utah. The company just finished a project with a price tag of over $1 million, building a set of six bronze gates for an equestrian farm in Wellington, Fla. The property is owned by hedge-fund manager Robert Mercer and his wife. The gates have jumping horse sculptures and horseshoes in place of handles. Several years earlier, the firm built a set of ornate bronze gates for Lee Anderson Sr., a construction-services magnate who had bought an oceanfront estate in Naples, Fla. "The idea with using bronze beams was that we wanted some privacy but not too much," says Mr. Anderson. "We wanted people to be able to see the house but not to be able to wander through it to the beach." "People don't think there are palaces in America, but there are in fact palaces all over," says Robert Baird, who co-owns Historical Arts with his brothers. "You just have to get behind the gate." A version of this article appeared April 13, 2012, on page D1 in the U.S. edition of The Wall Street Journal, with the headline: The State of the Gate.